Espresso Fredo – it may look harmless, but be warned..
Now, you might think I’m making a big thing of this, but in the past I have been known to be quite the coffee fascist. I have a particular way I like it in the UK, a kind of a cross between a double macchiato and a dry cappuccino. Woe betide any barrista who crosses my path and can’t rise to the challenge. So, you can imagine my shock, sadness, outrage ( OK I’m overdoing it a bit now) when I first encountered the phenomenon of Greeks and their obsession with iced coffee. It might just be a personal thing, but I’m a firm believer that both tea and coffee should be drank hot. Iced tea, sorry, I just don’t get it. Iced coffee, hmmm, …. the work of the devil as far as I’m concerned. So why do they love it so much. 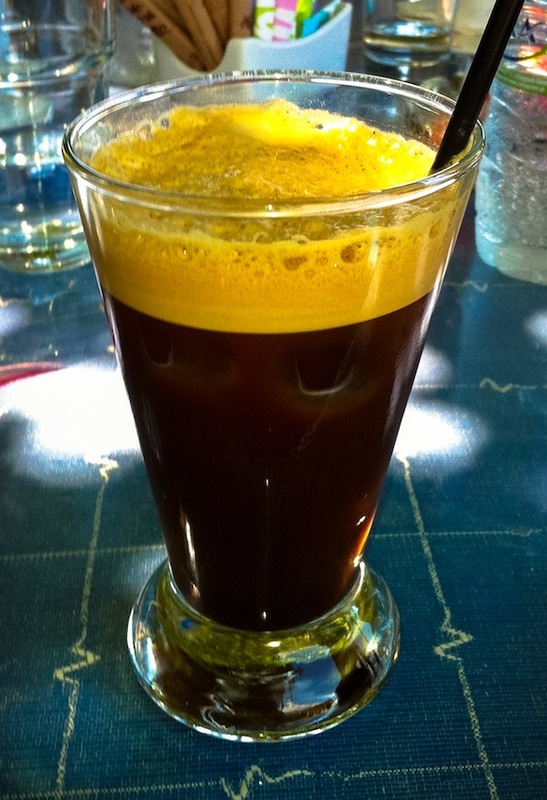 As much as the Brits love a cuppa, the Italians an expresso, iced coffee is the shizzle in Greece. My cultural ambassador informs me there are 3 sinister blends to consider. Espresso fredo (above), cappuccino fredo and frappe. Having nothing to lose, I took the plunge and ordered the espresso version. So what’s the verdict? Well, pretty much what you’d expect. Tasted like a triple espresso topped up with water and loads of ice cubes. On the positive, it was nice and strong. That was about it. No other redeeming factors. My intelligence informs me the frappe is particularly obnoxious, containing a seizure-inducing amount of Nescafe instant coffee, served in a pint glass with loads of ice. As irresistible as it sounded I had to give it a miss. So why do the Greeks love this stuff so much? I’ve no idea but I have my theories. The iced coffee here is so strong it’s like sipping a Red Bull. You can’t gulp it down or your head would start spinning around like the girl in the exorcist. People sit for literally hours in the cafes here with a single frappe. It’s the perfect tipple in a crisis ridden economy. One drink lasts for a whole day, or three sips in my case. to the coffee fascist: am disappointed; you are not ready to celebrate difference and embrace the greek culture… it will take time! @T Democracy, philosophy, even cheese I am willing to celebrate. As for iced coffee….. hell will freeze before I become a fan.